Last weekend’s New York Comic Con — the East Coast’s largest comic book and pop culture exposition – included an unexpected sight: Diagonally across the aisle from the Marvel Comics booth, surrounded by the usual assortment of attendees sporting superhero costumes, was a large booth for Craftsman tools. The division of Sears Holdings was hawking its Bolt-On tool system to the Comic Con crowd, an indication that the New York version of Comic Con may be moving beyond superheroes and science fiction into mainstream consumer products. Chevrolet was also there — as a partner sponsor of the event — with multiple points of presence at the show, including a large booth on the main floor, a contest featuring a line of Chevy Sparks in the lobby of the Javits Center and a car being decorated by professional comic book illustrators in “Artist Alley.” The Chevy booth emphasized the company’s pop culture connections by displaying the Camaro that plays the role of Bumblebee in Michael Bay’s Transformers films. On view was both the actual car and, lumbering around the booth, a large version of the robot which the car transforms into during the movies. Craftsman tools at New York Comic Con. Photo by Kendall Whitehouse. 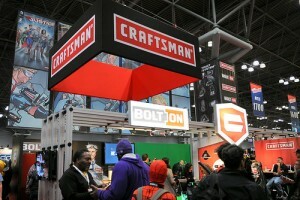 Craftsman also sought to link their products to the convention’s superhero ethos by distributing a comic book created in conjunction with DC Comics in which a character called “The Technician” saves the day for Superman, Batman and the rest of the Justice League by using the Craftsman Bolt-On tool system. “Accomplishing a DIY [do it yourself] project can make you feel like a superhero in your home,” senior vice president SVP Michael Castleman noted in a company press release. As geek culture goes mainstream, mainstream vendors are striving to tap into the nerd zeitgeist. Consumer brands outside the usual Comic Con realm of superheroes, science fiction and fantasy are looking to appeal to the large and enthusiastic crowds at Comic Con to raise awareness of their products among members of the Millennial generation. New York Comic Con, run by the ReedPop division of Reed Elsevier, is the largest such event on the East Coast, drawing more than 115,000 attendees this year. The New York event, which started in 2006, is second in scale only to the annual event in San Diego run by the non-profit Comic-Con International, which attracted roughly 130,000 participants this past July. Considering its decades-long presence in American culture, “One could argue that Chevy is pop culture,” Hedges said, adding that Chevy is “thinking outside the box” with this approach to marketing. While some have bemoaned the “Hollywoodization” of Comic Cons that began as gatherings for fans of comic books, many now accept the encroachment of movies and television into the Cons. “Everyone’s over that now,” says comic book creator and writer Anina Bennett, who regularly markets her books at various Cons with her husband, artist Paul Guinan. As creative properties move between comics books, video games, movies and television, many see the trend as not only inevitable, but advantageous as well. The broadening scope of the Comic Cons into movies and television reflects the cross-pollination of these media in the entertainment industry. And certainly many fans embrace the trend — as the capacity crowds for the popular movie and TV panels indicate. It’s less clear if fans and industry professionals will embrace the addition of consumer brands outside the entertainment sphere. “If [Comic Con] becomes a general merchandise show, that’s when we’ll stop coming,” says Bennett. This blog post was written by Kendall Whitehouse, Knowledge@Wharton’s technology and media editor, who just returned from New York Comic Con. For Whitehouse’s photos from the Con, see his Flickr photostream, and for previous reports on the event, see his blog, On Technology and Media.